It is a time when we need a hero to step forward. We lost one when Senator John McCain .headed off to Valhalla this week. I didn’t agree with practically any of his political positions. But the man stood up for what’s right and what’s wrong. He took stances routinely that went against some of the worst drivers of Republican actions. He prevented them from doing a lot of worse evils. My Republican friends in Iowa disparaged McCain just as Trump did as a RINO (Republican In Name Only). But he stood up for us with the thumb down gesture when the evil Republican Oligarchs were voting to take away the gains in health care that we made under Obama. It is a time when we need a hero to step forward. Of course, we are always in need of heroes. There is so much in our little lives that depends on the strong among us to shield us from the darkness that fills the universe. And heroes come in many forms. There was a time when I needed a hero to step forward and deliver me from evil in the Emergency Room in Pearsall Texas. I was there because I was suffering from a severe lack of potassium in my bloodstream. You don’t realize how important balanced potassium in the bloodstream is until you don’t have it. The shakes, the pain, the fog interfering with my cognitive functioning would all have overwhelmed me permanently if the banana doctor had not run a potassium-rich IV directly into a vein in my arm and then proscribed bananas and apples in my diet when he let me go home without an expensive hospital stay. I never learned his name, hence the epithet of “banana doctor”, but he was a hero to me when I needed one. I think the real point here is, though, that we are forever needing heroes to step up. More than once, as a school teacher, it was me who was called on to step up and do the hero job. Talking on the phone late on a Saturday night to a suffering, suicidal teen, getting between two middle school girls and a leering stranger on a field trip in San Antonio, facing down a berserk child with real metal ninja throwing stars in a school hallway and getting him to run away rather than pursuing his target… gawd, looking back, I should’ve been scared out of my wits. Don’t tell my mother that those things really happened. And maybe that is the only place we should really be looking for heroes, inside ourselves. Believe me, there is no Superman or Wolverine in the real world outside of the one in your own heart. And that one will step up and answer the call if you sincerely need him… or her. Take it from a guy once known in high school as “Superchicken”. Now there’s an inspiring superhero name! 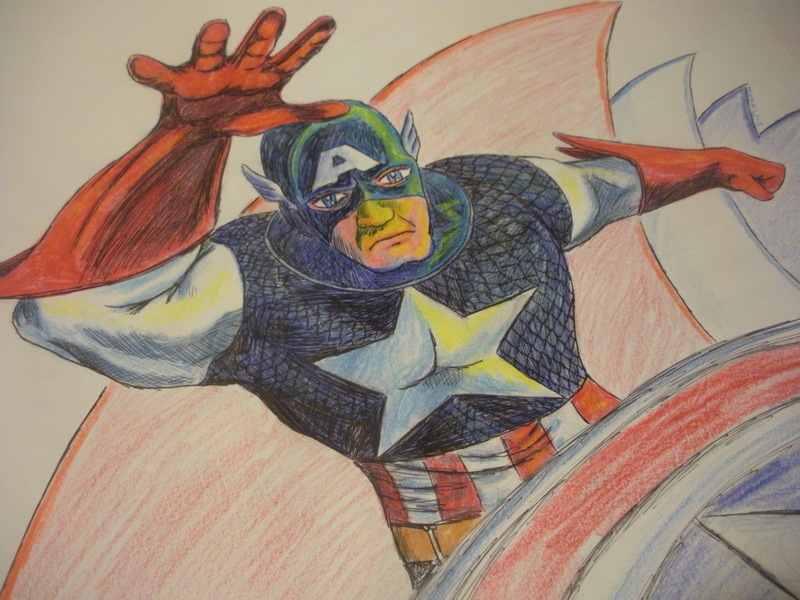 Muck Man took his family to see the new Captain America movie last night. I told you they would, since they are a superhero family just learning how to be a superhero family with odor-based super powers. They all loved it, as was to be expected. But it was a great movie experience because it was full of unforeseen surprises. The first big surprise came from Muck Lad. Muck Man chose the Friday showing at Valley View Mall because Muck Lad had to work both Saturday and Sunday and couldn’t attend otherwise. His job at the Asian Market making and serving boba tea is the most important factor in his life right now. He needs the money to buy a gaming computer. You know how important that is to a teenager in this day and age. But when the time came to go to the movie, as much as he really wanted to see it, his headache was too much to allow him to go. He needed to stay in the Muck Cave with Muck Dog and play RPG computer games instead. The second big surprise came after Muck Momma drove Muck Man and Muck Girl… er, Muck Woman… to the mall and the movie actually began. Muck Man is such a big comic book fan that he read every Civil War comic book he could lay his smelly hands on back when it was a big multi-comic event thingy in the Marvel Universe. There must’ve been at least a hundred titles to track down, and either purchase to read multiple times, or find in the library to read when Mucky was supposed to be doing other more school-teachery things. And as the movie unfolded, besides the fact that there was a big disagreement between Iron Man and Captain America that made everybody choose up sides, nothing was the same at all! The story was good, and made sense in the context of the other Marvel Movies, but the details were all different and the story was completely new. Not only new, but better! Muck Man was fully prepared to face one of the two major characters dying at the end of the movie, because that’s how the comic books turned out. But in point of fact, the movie found a much better way. Muck Man tells me I can’t explain that point further because spoilers are simply not allowed in a world where heroes are real. Muck Girl… er, Muck Woman… was surprised at how much she liked the character of Spider Man played by young Tom Holland. The character was played as a teenager. A rather handsome, wisecracking teenager with some killer superhero moves. And a new Spider Man movie was promised at the end. Muck Girl… er, Muck Woman… was enthralled in ways only a Muck teenage girl… er, woman… can be. And the movie was seriously funny. That was, perhaps, the best surprise of all (even if it is an oxymoron). There were more light-hearted moments than tragic ones, more laughs than tears. It taught Muck Man and his Muck Family a very important lesson about how to be a superhero. Being all dark and violent and Batman-y is fine for DC superhero movies, but it is also the reason we don’t love them as much. And the delayed-for-another-time surprise was the trailer we got to see for Dr. Strange on the big screen. Muck Girl… er, Muck Woman… is not-so-secretly in love with Benedict Cumberbatch too. The Muck Family’s plans for movies in November are now set. I recently revealed the existence of a new superhero in Dallas, the Magnificent Muck Man, master of muck and mud and maddening stench. Remember, his superpower is the ability to produce smells so awful they paralyze, neutralize, and even euthanize every opponent. Now, every superhero needs his secret lair. Batman has the Batcave. Superman has the Fortress of Solitude. The Avengers have Avenger’s Mansion… oh, uh, maybe they’re not all secret. But, anyway, Muck Man has the Muck Cave. Yes, it is based on my house. I am old. I have six incurable diseases. So cleaning is difficult. And I don’t always smell that good myself. But I am not trying to claim I am Muck Man’s secret identity. The fool almost revealed his secret identity by smelling bad in an elevator… so I have to be more careful not to out him. Anyway, the Muck Cave is Muck Man’s secret lair and base of operations. It is a normal-looking residential suburban house, on the outside. Inside, it is a hideous maze of garbage piles, discarded soiled laundry, random dog poo from Muck Dog, and a layer of wetness from incessantly overflowing toilets. Okay, there is another secret out. Muck Man has kids at home. How else do you explain how an ordinary house becomes an unnatural flowing fountain of filth? Muck Lad, however, likes his name… almost as much as he likes living in the Muck Cave. Teenage boys and filth-laden rooms in the Muck Cave are simply made for each other. And Muck Lad can’t wait to use his patented stink-saber on evil. It’s like a Star Wars light saber, except it creates a blade of solid stink that can cut through anything. As the new superhero team prepares to get into crime fighting, I have it on good authority that they plan to go see the new Marvel movie Captain America: Civil War tonight. I believe they plan to take notes on how it all works. I love Marvel Comics, and, as a result, I am also falling in love with the Marvel Superhero movies. I spent this morning drooling over the Flash TV series which has that wonderful comic book wiseacre flavor. And I decided that Dallas needs its own superhero. So, using the toxic pollution in the city air and the natural ability of the human body to adapt to anything, Muck Man is born. Yes, Muck Man, the toxic hero who smells so bad that bad guys don’t have a chance. Severe odor is his super power. He can remove his shoes and take down a regiment of evil villain minions with a wave of foot-fungus incredo-stink. He can radiate infected ear-wax smells through the earwax antennas on his helmet. And, of course, he can go fully nuclear with a Muck Man power fart. The Magnificent Muck Man has a secret identity too. He is a mild-mannered retired school teacher by day, pursuing a mundane and forgettable career as a writer until the city is threatened by a super villain. And he is coming. Behold, the Angry Orange King. He is tramping toward us in Angry Tramp Boots looking to tramp all over the basic human rights of people he doesn’t like. Especially poor people he doesn’t like. He gives rude finger gestures to the masses with the fingers of his tiny, tiny hands. And he likes to build gigantic things and make other people pay for them. He has recently defeated the homegrown lizard-man super villain that represents our state. He used his super villain power to hang insulting nicknames on people, and we all know that nicknames can be fatal, especially to lizard-people. Many would argue that the Angry Orange King hasn’t won total victory yet. He still has to defeat one more opponent before the frightened nation turns the keys to the kingdom over to him. But there is no guarantee that he will be beaten, as no other contender has beaten him yet, despite everything the wise monkeys claim to be true. So the confrontation is set to happen. Blow-hard insult master against the world’s greatest source of stinky justice. Who will win? Nobody knows for sure. But for me, I tend to side with goodness over evil. Okay, now here’s what we comic-book nerds call a spoiler alert. This movie we saw last night provided changes to the Marvel universe that positively thrilled and enchanted me. 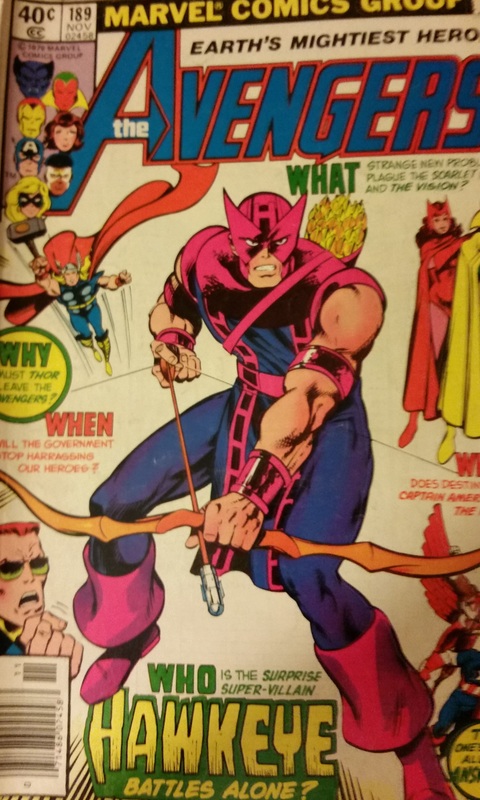 Hawkeye, the bowman with entirely self-taught swashbuckler skills and no super-powers was revealed to have a wife and kids. His lady-Avenger friend Natasha, the Black Widow, has apparently known about the family all along and is even friends with his kids. Where once we presumed a romance between the two, we now find a redefinition of the relationship that changes everything. It even allows the story to set up a tragic romance between Natasha and Bruce Banner where she utters the classic line, “We are really both monsters,” in a very tender and heart-wrenching moment. The line is later repeated by Tony Stark to the Hulk, creating a beautifully done theme of the duality between hero and monster, hero and villain. Two new Avengers are introduced and their tragic back-story is added to the hero vs. villain, hero vs. monster thematic mix. 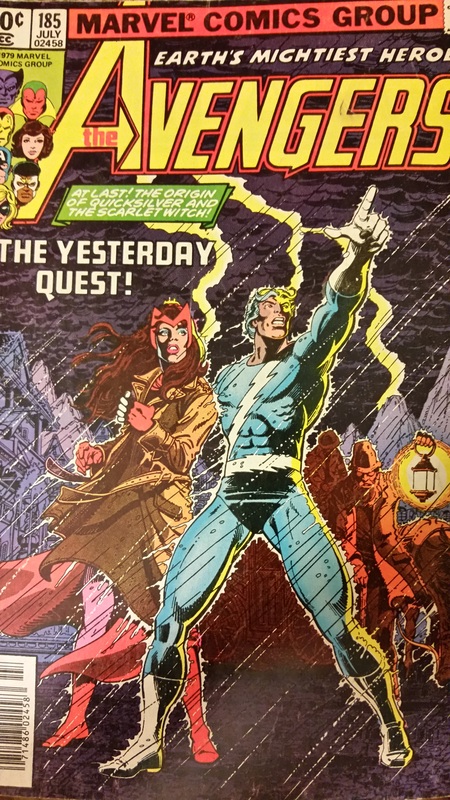 When I first started reading Avengers comics in the barber shop in my home town back in the 60’s Wanda and Pietro Maximoff, the Scarlet Witch and Quicksilver, were already a fixed part of the Avengers, but their complex and convoluted back story as mutant children of Magneto raised by Gypsies had not yet been developed. These beloved characters have always had a sinister side. You never knew for sure if you could trust them or count on them. They were children of Magneto and had been a part of the Brotherhood of Evil Mutants. Wanda’s powers were dark, unpredictable, and potentially world-consuming. In this movie they are given a different back story, attached first to the Hydra villain Baron Strucker, and then to the ultimate villain of the piece, Ultron himself, the indestructible and omnipresent metal man. The final piece of the delicious Avengers 2 pie is Ultron himself. 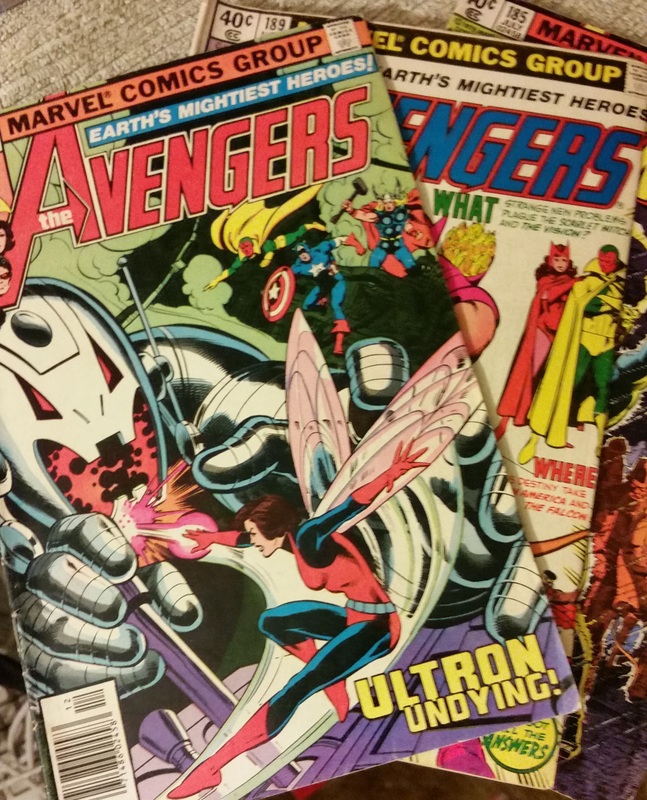 Much like Thanos in the first movie, Ultron causes nerd-spasms in the love organs of comic-book nuts like me. Especially when such love and care was taken to get the story right. In the comics he was created by Hank Pym, also known as Ant-Man, and the movie changes his creator into Tony Stark and Bruce Banner. But the essential angst of the character, a Frankenstein’s monster sort of story, is still there. He both loves and hates his creator. There is an extended metaphor in Ultron’s eventual creation of the more human-like android Vision. Ultron keeps alluding to Pinocchio by repeating the phrase, “There are no strings on me,” and the Vision is portrayed as his attempt become a “real boy”. Yet, it is still a Frankenstein story. Just as Stark is afraid of his creation and fears his own destruction at Ultron’s hands, Ultron is most afraid of Vision, and the final piece of the Ultron personality is regretfully extinguished by Vision. Now that my book report on this movie experience is drawing to a close, it is safe to conclude that the reason I loved it so much, besides the fact that I could share comic-book lore with my non-comic-book-reading family, is the depth of ideas in this movie, and the chance it gave me to reconnect with old stories, re-percolate them, and brew something entirely new.